Top notch! Exclusive apartments fitted out with only the best quality appliances and furnishings. Breakfast made and served in our apartment was a banquet! 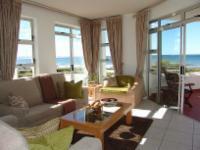 Ivory sands, sparkling surf and a gloriously temperate climate make Jeffreys Bay a sun-seeker’s playground. Set in lush gardens, the Mediterranean style air-conditioned apartments and Penthouse are spacious and tastefully decorated, and include modern comforts and WiFi. Watch the dolphins and whales visiting the bay from well positioned patios and balconies, or relax at the rim-flow pool with its wide deck. Scrumptious breakfasts are unhurried and served in the comfort of your suite. 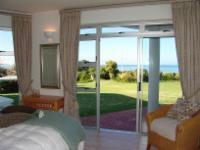 "Our stay at Diaz-15 in Jeffreys Bay was delightful and memorable. The accommodations and sea views were superb; having breakfast made to order by hotel staff in our suite was a real treat. And, the owners couldn't have been nicer: discreet but always there when you had a question or a problem. Should we return to Jeffreys Bay in the future, we will certainly stay there, and I will recommend the establishment to friends and family members who plan to travel to South Africa. With thanks and regards, "
"Amazing Experience. The owner was friendly and very helpful. I was only there for one night but it was really fantastic and totally welcoming. Have recommended the place to all my friends. My parents are old and i wanted a welcoming and homely experience with luxury to spoil them and this was all included in this beautiful home away from home. Coennie was a wonderful host." "Amazing place. Super helpful. Great local advice. Breakfasts got for royalty. No one could ever be disappointed." "Lovely Accomodations with attention to detail, one of the best B&B's we stayed at and the owners were very friendly and hospitable. The place was beautifully decorated and the views of Jeffery's beach were unbelievable. We had some of the best sunsets siting on the balcony right outside the bedroom door. Will return in the future. Michael Hebert"
From the N2 from Cape Town, take the first turn-off to Jeffreys Bay or from Port Elizabeth, take second turn-off to Jeffreys Bay. Turn left into De Reyger Street and drive down to the T-intersection with Diaz Road. Diaz 15 is situated at 15 Diaz Road, almost across the T-intersection.